A Wikibookian suggests that this book or chapter be merged with General Astronomy. Please discuss whether or not this merger should happen on the discussion page. Auriga is a constellation made up of Capella (its brightest star), and three "kids" (labelled Epsilon, Zeta, and Eta). 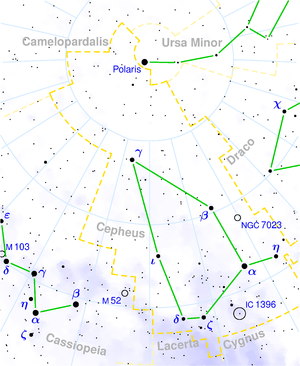 There is a skinny, A-shaped asterism in Andromeda which you can use to find Perseus. At the top of the A is Alpheratz, and Mirach and Almach make up one of the A's sides. If you follow the legs of the A, you'll find Perseus. (Actually, it looks more like a "V". The reason why "A" was chosen was to form the mnemonic "A in Andromeda.") The Andromeda Galaxy (M31) is a spiral galaxy within Andromeda. The constellation Boötes is shaped like a kite. Aquila (The Eagle): Although it appears that Altair is at the top of this constellation, there is actually one star above it (Tarazed, Gamma Aquilae). Centaurus: Alpha Centauri is not one star, but a system of three. Proxima Centauri, in this system, is the closest star to our solar system. It is 4.2 light-years away. Perseus: Algol (Beta Persei) gets its name from the Arabic al Ghul, meaning "Demon Star." It is an eclipsing binary. Cepheus. Delta Cephei is a pulsating star, with a period of 5.4 days.